Yankee Alpha Foxtrot Bravo: "I Didn't Know It Would Be THIS AWESOME!!" "I Didn't Know It Would Be THIS AWESOME!!" 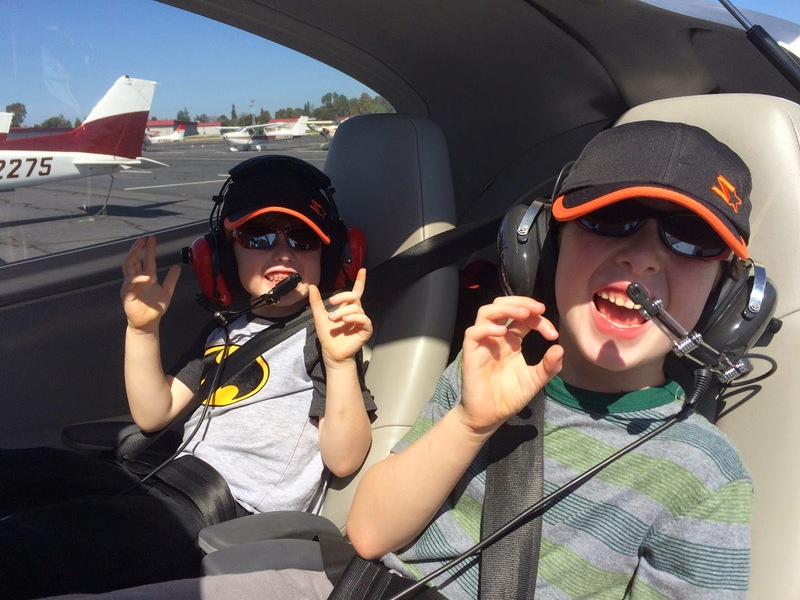 My little five-year-old nephew Simon looks at me from the back seat of one of the club's DA-40s and says loudly into his headset mic "WOW!! I didn't know it would be THIS AWESOME!!" (he speaks A LOT in UPPER CASE). We're 2,500' over the Golden Gate, circling the bridge, in smooth perfect VMC, and besides Simon there's also Alex (seven), and their mother Annette in the plane. 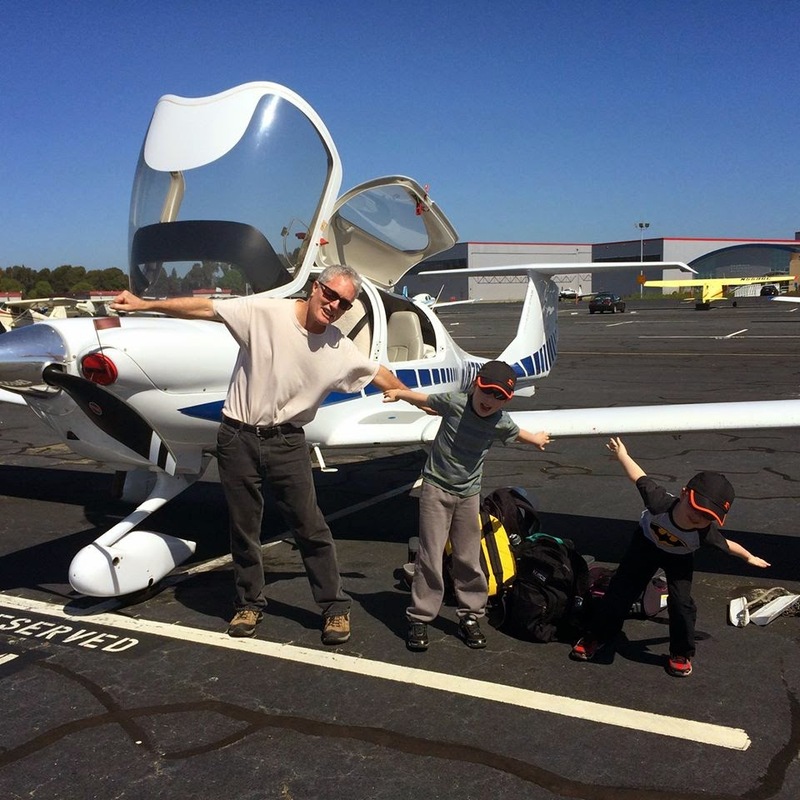 Alex and Annette and I have flown a couple of times before — the last time being just over a year ago — but this is the first time for Simon, and I was worried he wouldn't like it (he's been a lot more apprehensive than Alex about doing things like this — Alex has always just plowed straight in…). As with Alex's first time, I needn't have worried — Simon's an enthusiastic passenger and spends much of the time pointing out things on the ground, taking photos with Annette's iPhone, and asking me to circle anything interesting (like ships or little islands). Alex is similarly enthusiastic, and given that they're both pretty voluble, I discover just how useful the Garmin panel's pilot isolation switch can be — there's just no way you can easily stop two brothers, five and seven, from arguing or talking loudly about what they're seeing, etc., regardless of what you tell them before you fly. I always find their chatter amusing, but when you're trying to talk to NorCal Approach on flight following as you maneuver around and over the Golden Gate and the rest of the Bay, isolation really comes in handy. I've never actually used that feature before, I think. We start a little earlier on the ground at Hayward (KHWD), with both kids really liking the "bubble" canopy (they just call it the bubble) and the general shape of the DA-40; we watch a couple of smaller helicopters taking off, and a rather large one landing, and both kids ask if we could do that. Sadly, no, but we do get to taxi slowly past several interesting planes — an old Stinson (I think), painted in black and white zebra stripes, really took their interest, as did the ancient four-engined JetStar business jet that's been sitting on the tarmac for ages now, looking gleamingly-Modern in an ancient sort of way (think James Bond and "Goldfinger"). Simon asks "what's a business jet? ", and I get into a long disquisition about business people and travel and stuff, then realize he doesn't really know what a "business" is. Oh well — Annette takes over the explaining as I do the runup. After the runup, we take off on 28L for the Oakland transition up over Interstate-880, with views of their home in Alameda off to our left (and my place somewhere below us). The view's wonderful, the air smooth, and the kids are entertained and enjoying things a lot as we head off towards the Golden Gate. They chatter on about the voices on what they call "Mission Control" (they're great NASA and space travel fans); I was worried that the standard headsets I borrowed from CalAir would be too big or uncomfortable, but both kids love wearing the headsets and talking into the microphones, and not for the first time I'm glad there's no push-to-talk in the back of the plane. It's a busy day, and there are a whole lot of other planes around us, both over the Golden Gate and further afield, and both on-frequency and not. NorCal calls a never-ending stream of traffic for us as I look out as paranoidly as I can; at one stage one of the old local sightseeing seaplanes (a Beaver, I suspect) goes well below us over the Bridge and then up towards Sausalito. Both kids excitedly swear it went under the bridge, but that ain't true (I was watching it like a hawk). After a few times around the Bridge and a pass over Alcatraz and Angel Island, we head off towards San Pablo Bay, where we do the inevitable little roller-coaster(ish) push-over / pull-up that Alex liked so much the last time; this time they both love it and keep asking for more, but Annette's turning green and I decide to head back via the Diablo Valley, where the kids spot all sorts of things on the ground. Coming back over the hills towards Hayward (with the inevitable "report Cal State Hayward" causing me to do my usual internal eye-rolling) we have some sort of mild audio issues, but I suspect that the combination of four headsets and kids and stuff may explain a lot of that, and the problem clears up after Hayward Tower pings me several times about the quality our transmissions. Oh well — no flight's ever perfect, I guess. But this one was pretty damn good, and the kids tell me they're going to tell their respective classes at school all about it tomorrow. And maybe in another year's time we'll do it again, if not sooner. What a great post. You are, without a doubt, the bestest uncle ever! Thank you John! It's a lot of fun being an uncle :-).